tundra landscape with freshwater ponds along the Arctic coast, by the Colville River, National Petroleum Reserves, Alaska. Thawing and freezing of Arctic tundra causes these freshwater ponds to form. 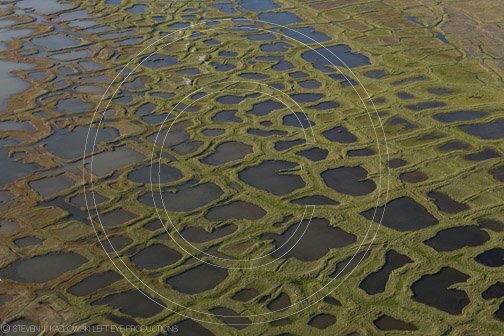 landscape, tundra, freshwater pond, pond, lake, wetland, water, arctic coast, national petroleum reserves, npr, colville river, arctic alaska, alaska, ak, north america, spring, aerial, horizontal, gallerytwo, © Copyright Steven J Kazlowski & Left Eye Productions. Images included in this database are protected under national and international copyright laws. Images may be used for comping purposes only and remain the property of Steven J Kazlowski and Left Eye Productions until authorised for use by purchase. Terms and conditions may apply.